Hands off the roses! Leave the last blossoms of the season on the plants. 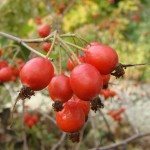 Some varieties will form beautiful hips for fall and winter interest. Also, pruning or deadheading encourages new growth that may or may not harden off before frost hits. Do not cut roses back in fall. Not only does it encourage tender new growth, it is best to leave canes up over the winter. Cold damage begins at the tips. The longer the cane, the better chance of you having living stems come spring. Some roses need winter protection, but many do not. If you have hybrid tea, floribunda, or grandiflora roses, they do best with protection from the cold. First, clean up the area around the rose, disposing of any diseased leaves. Make sure the plant is well watered until it loses its leaves and goes dormant. When the ground has frozen (usually after three hard frosts or mid to late December), apply a mound of compost, shredded leaves, mulch or topsoil over the base of the rose. You may find a ring of chicken wire works well to keep material contained. Remove any protection in spring, once temperatures are consistently above freezing. Shrub roses do not need winter protection, especially if they are grown on their own roots and not grafted. Varieties such as Knock-Out, Oso-Easy, and Flower Carpet are all winter-hardy and can be left alone.